As from this moment on, EBMA is running a competition for one lucky winner to receive a beautiful Deering Goodtime Banjo! Courtesy of America's premier banjo maker, this banjo (with it's gig bag) will be raffled off next Sunday 3 August, during La Roche Bluegrass Festival in France! Tickets will be sold during the festival from Wednesday evening, 30th July through Sunday late afternoon, 3rd August 2014. But even if you are not attending this wonderful festival, you have the opportunity to win via online entry! Enter and purchase as many tickets as you wish! For each entry, a ticket (or two) with your name will be placed in the draw! Each ticket costs €3 (two for €5). You will be helping to sustain EBMA's efforts in bluegrass and possibly win a beautiful instrument! Many thanks to Deering Banjos (http://www.deeringbanjos.com/) for their support! BUY YOUR RAFFLE TICKET(s) NOW UNTIL Sunday, 3rd August, 5pm! The second release from IBMA's 2013 Emerging Artist of the Year nominee, Flatt Lonesome, displays a talented, tight group that brings a new level of maturity to their stellar – yet still youthful – musicianship. Flatt Lonesome's album, Too, is soaring with sibling harmonies and hot picking that resounds in "So Far" to the serene, lonesome ballad "Make it Through the Day." 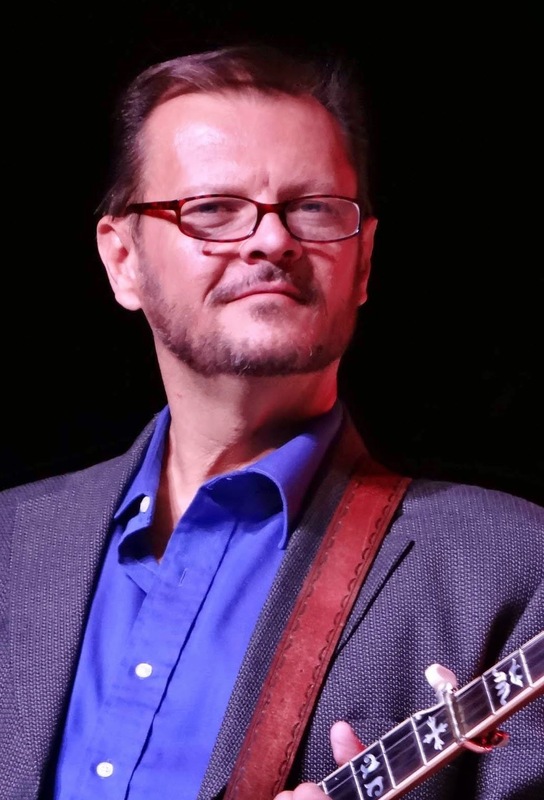 The band shines on Tim Stafford's original "Dangerous Dan" and "Never Let Me Go" resonates with a playful swing style that demonstrates Flatt Lonesome's versatility. "Since the last release, we've learned even more about how to be a band," says singer and mandolin player Kelsi Harrigill. "We still enjoy showcasing each member on this album, but our performance as a unit has created an even stronger musical bond. 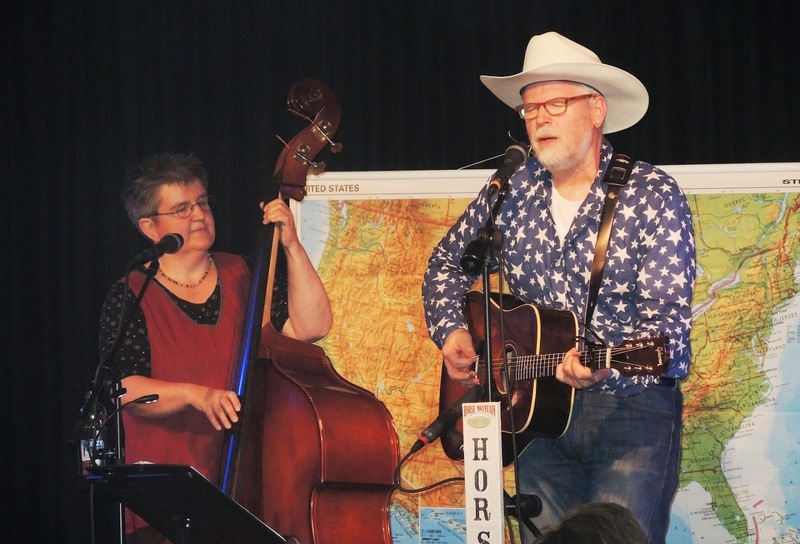 We are really finding our identity as the band Flatt Lonesome." Flatt Lonesome considers itself a family even beyond ties of blood and marriage. Their close bond is a result of both a life on the road performing as well as shared convictions. In addition to Bluegrass standards and originals, the band includes original Gospel songs that are delivered with sincerity. With Too, Flatt Lonesome offers Bluegrass lovers a confident look into the future of the genre. Here is a video made by the band about the making of "Too"
Flatt Lonesome has already enjoyed many highlights as a relatively young band. Performances have included the Joe Val Bluegrass Festival (Boston, MA), California Bluegrass Association Festival (Grass Valley, CA), Summergrass (San Diego, CA), IBMA FanFest, The Grand Ole Opry's 87th Birthday Bash, The World Famous Station Inn, the Red, White & Bluegrass festival (Morganton, NC), and The Lakes Festival (Pine River, MN). With their friend and mentor, Barry Waldrep, the band has played Music City Roots where they received a thunderous standing ovation and garnered many new fans from among the music-savvy audience. Flatt Lonesome has opened for Marty Stuart and even had Zac Brown join them on stage while performing in Georgia. "Too" is available for purchase at www.flattlonesome.com, iTunes, Amazon, etc. · SEAGULL S6 Original – now in colour! · ZeroGlide – newly discoverd! · LAKEWOOD M-31CP – good looking, versatile sound, good price! · FENDER American Deluxe or Standard Ash? Your choice! · FENDER Rumble V3 – Bass amps revised! · NATIONAL Resolectric – Sunburst or Revolver! · STRAP-JACK: simple but effective!! If you're in Switzerland and short of strings and plectrums or anything else, this is where you will find it all! Check it out! Alison Brown, musician and founder of Compass Records said of Richard, "His knowledge..is truly remarkable and his solo banjo recordings have established him as one of the leading banjo players in the world." "I had a great tour in the US teaching, recording, and performing. I was one of the teachers at Steve Gulley & Dale Ann Bradley - Arts In The Gap/Acoustic Music Week on the campus of Lincoln Memorial University in Harrogate, TN. I also taught a banjo workshop at the world famous ROMP festival in Owensboro, KY. I also played some great music with Velvet Blue and WestWend. 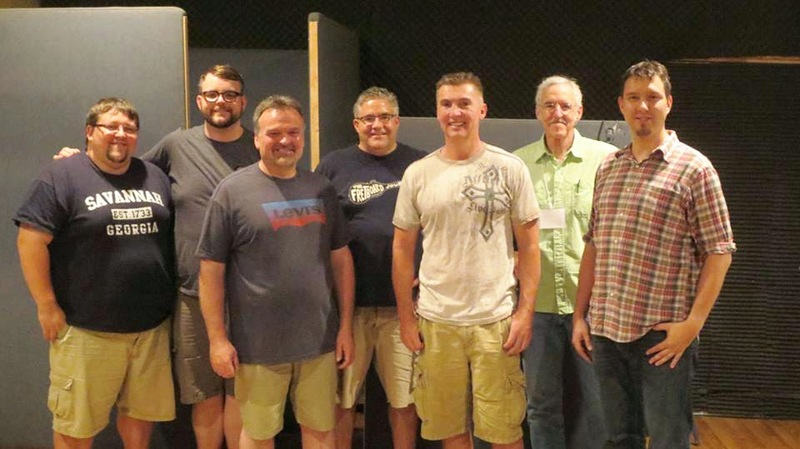 The most exciting thing for me was recording the first promo single for my upcoming CD with amazing players like Kenny Smith - Guitar, Brandon Godman - Fiddle, Alan Bibey - Mandolin, and Marshall Wilborn - Bass. More information about that song will be on my website soon." Pictures of Richard's travel can be found on his Facebook page. "This is a brand new band which plays my original music with new arrangements. We want to introduce banjo music to a new audience and show them that the banjo can move them in ways they didn’t realize before. The band includes: Richard Ciferský on the banjo and guitar, Oldo Petráš - drums, Dano Axmann - mandolin and harmonica, and Andrej Jeriga - bass." For news of the RC Project and other endeavours, visit Richard's website. Just wanted to share the great experience we had last July 17th at the Nocturama Concert Series opening for local legend Pajaro in our hometown of Seville, Spain. A nice crowd of 800+ people gathered for a warm night (25º C at midnight!!) of awesome music. It was a mixed set as Surrounders and Pajaro blended styles and musicians throughout the night to everybody´s enjoyment mixing Andalusian Surf rock with bluegrass, old-time and swing. We made a lot of new friends and introduced a large audience to bluegrass music which they seemed enjoy greatly. In the picture from left to right Manuel R. Dastis (Surrounders), Raul Fernandez (Pajaro), Paco Lamato (Surrounders), Roque Torralva (Pajaro), Javier Dura (Surrounders), Ramon Ramos (Surrounders). See you all in La Roche! 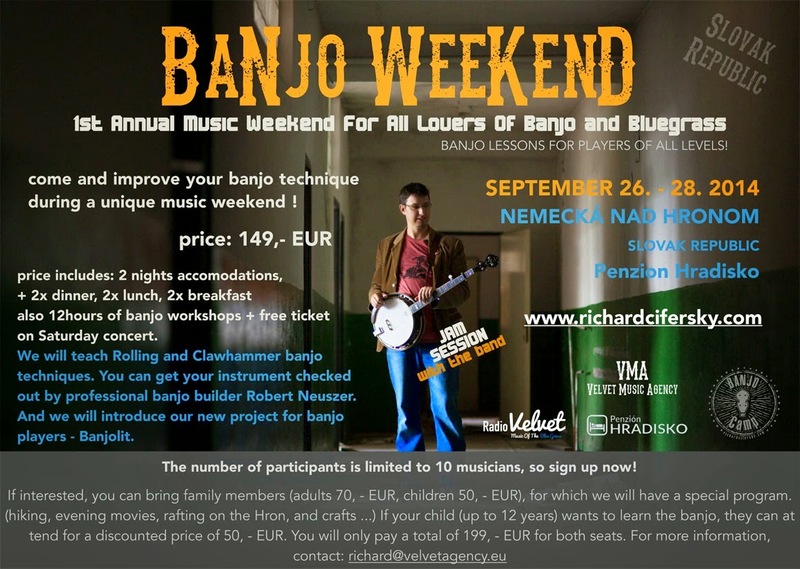 Richard Cifersky and Velvet Music Agency proudly announce the 1st Annual Music Weekend For All Lovers Of Banjo and Bluegrass Music! 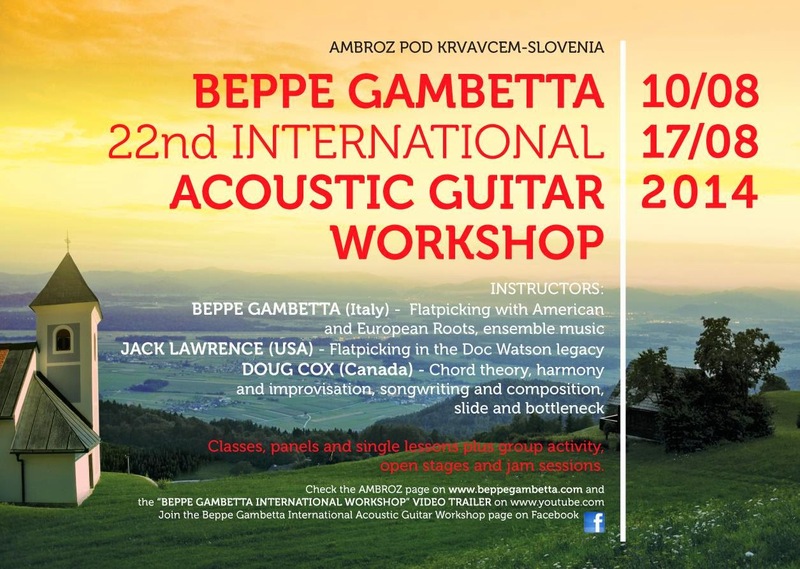 This music retreat will be held in the beautiful hills of central Slovakia, where you will get the chance to meet your fellow banjo players and bluegrass musicians from all over Europe in a unique music environment. 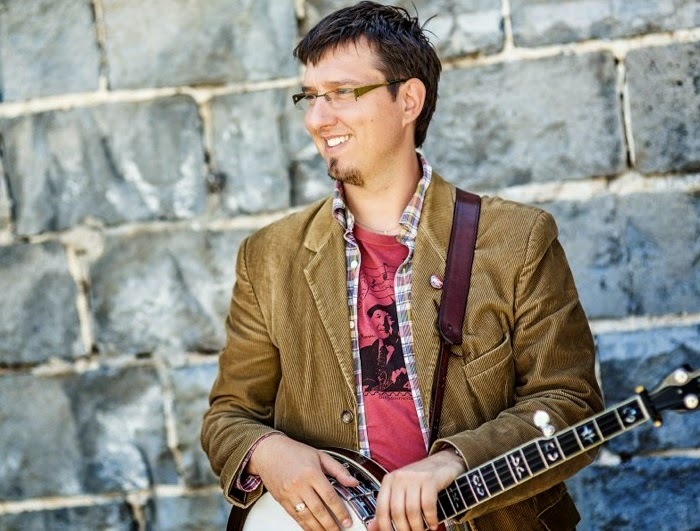 Bennett Sullivan, a banjo player and educator living in New York City, recently partnered with Jiri Markalous, a Czech iPhone/iPad developer to create a brand new learning tool for banjo players based on a teaching method Bennett came up with. The app is called Listen & Learn: Banjo, and is available on the App Store for $1.99. EBMA is now looking for someone to test the app and write a review for our blog. If you are interested, please send us a quick e-mail and tell us, why you're the one. First come - first served. Bennett has been performing and teaching for the past 10 years.He's currently involved in a new musical written by Steve Martin and Edie Brickell, called "Bright Star," that is scheduled to hit broadway in early 2015. His personal website/blog is www.bennettsullivanmusic.com. Running from August 24th to 30th, MinierAcustica will be running an acoustic music workshop in the Italian region of Marche near the picturesque town of Urbino. MinierAcustica offers a special opportunity to all of its participating students. Not only will participants benefit by learning from these masters of their instruments, but will also improve by playing within a group under the coaching of the teachers. The 3rd Locarno Folk Festival will take place from the 21st to the 23rd of August and, once again, will be held in the the garden of Teatro Paravento. 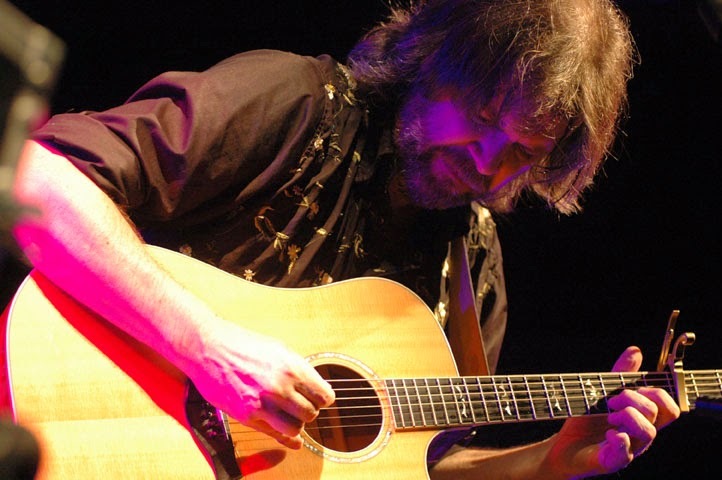 Beppe Gambetta will open the festival with a tribute to Pete Seeger who died at the beginning of this year. This will be followed by a Mediterranean night with I Liguriani e Kollektiv Istanbul. The festival will conclude with a “Noche Latina” with the Tango Tinto and Lariba (Cuba/CH). Not to be missed: a concert of local music with L’Alphorn Group, workshops and film screenings. 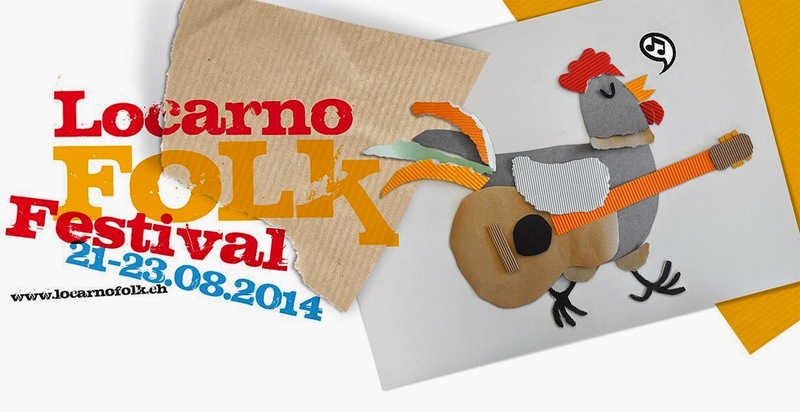 The full programme can be found on the Locarno Folk Festival website. Beppe’s tribute will celebrate the music and the life of Pete Seeger, father of folk music who died last February at the age of 94. Beppe will play music from Pete and his friends and will include songs that express the high ideals that Seeger stood up for in his life. Beppe will also tell stories and recollections of his meetings with this great man. Amongst the guests on stage during the tribute will be some children performing, as Pete surely would have loved to see. The evening will be introduced by Swiss journalist Alcide Bernasconi.